Tonight we celebrate a momentous milestone – Welcome to the reunion of the early 70s and 80s Filipino Migrants in Victoria, Australia. I am so overwhelmed and honoured to have been given the opportunity to address you all tonight. WE ARE THE PIONEERS…. When we migrated in the early 70s and 80s, we had the vision and dream as young settlers in Australia to have a better life for our young families, extended families and relatives and we have achieved that – and made a difference. A successful function like this is not possible without great organisers. I would like to acknowledge Hugo Boy Espenida, Tesia Magpantay, Caram Singh, Chito Balazo, Jessie Sison, Louie Lawang, Geraldine Presnillo and all the supporters behind the scenes for their tireless efforts in making this event a reality. According to Boy Hugo, this reunion plan was conceived in one of the wakes or padasal of one of our contemporaries who died recently. Everytime daw na nagkikita kita sila ay tuwing mayroong sumakabilang buhay na kaibigan. Bakit daw hindi tayo magkaroon ng reunion habang malalakas pa – in happy times – not in sad times – and reminisce about all our experiences of the good old days. So nabuo po ang reunion – at grand star talaga! On a serious note, the huge attendance here tonight signifies our burning desire to reconnect and bond and see old friends again. Kahit may athritis at masasakit na ang mga buto we all made a special effort to be here – pambihira po ito. I understand from Boy Espenida that there are over 470 guests ngayon dito! Following the lifting of the White Australian policy in 1973, the program for migration of skilled Filipino tradesmen started, and in October 1974 they started to arrive by batches under the Australian Government Assisted Passage Migration Scheme. Being assisted by the government meant your skills and qualifications were highly required in Australia hence you and your family were accorded with great privileges including financial assistance, free airline tickets, medical insurance, and accommodation subsidies. I was lucky to be included amongst the first batch; together with many of you here tonight who were also assisted migrants. The ones who were also approved here are qualified Accountants, Computer Programmers, Teachers, Nurses, Secretaries, and Spouses of Australians. Of course there were those who came here long before us since 1901. We were all hurled into a totally different culture – we could either swim or sink. It was important for us to prove that Filipinos were decent, hardworking members of the community. It was very daunting at the start – we had to adjust to the Aussie accent, way of life, weather, food, work procedures etc. We survived because we are resilient, trained to work hard and diligent, we speak english, we have good work ethics and we were prepared to assimilate in this new society. Initially, the trades people were housed in hostels – Midway Hostel in Maribyrnong, Nunawading Eastbridge Hostel and some from Springvale Enterprise Hostel. With my young family – my wife Lita , son Dennis who was 2 ½ years old and daughter Joy – 6 months old at that time – we were housed at Midway Hostel in Marybyrnong. Food was abundant – milk, bread, cereals, mashed potatoes, bacon, ham, salami, beef, lamb, chicken, porridge, even stewed rabbits, fish and chips, salads, desserts. Parang handaan ni Napoles sa Pinas! Occasionally they would serve boiled rice – pero hilaw po ang luto – these were the usual Aussie meals served at the hostel, day in and day out. After awhile, sawa na po kami – we were experiencing mental food starvation – naghahanap na ng Filipino food – adobo, sinigang, kare-kare at tamang luto ng kanin. We were so happy to have discovered the trash and treasure market – lots of treasure at that time indeed – to buy our second hand pots and pans and then secretly we cooked in our bathrooms. My first driving experience which was meant to be a breeze as I had been driving for years in Manila turned to be a nightmare at times where I would make a wrong turn, driving on the wrong side of the road. Here in Australia we drive on the left hand side of the road and the steering wheel is on the right side. Baligtad sa atin, we drive the other way around. We have to adjust in crossing the roads too, have to observe the road rules!! The Aussie slang and twang were foreign to my ears. I remember in my first job when my Aussie workmate said, “Eddie let’s go to the pub, I will meet you at the car park and I will shout you for a drink mate.” Car park? – oooh ano ‘yon – then I figured he meant the parking lot. Didn’t know what shout meant, hihiyaw daw siya but I came along anyway. He ordered a pot of “VB’’ and gave a toast for good friendship. After the first pot, he turned to me and said “Hey mate it’s your shout now.” Aaah now I learned it was my turn to buy the beer, sa totoo lang, sa pinas pag kinumbida ka, taya ka! I now know that flats mean apartments and funny enough at one stage we had a group in Hope street, Brunswick who all lived in flats. We met every week socially as we were so homesick – lots of laughter, singing, dancing and we called the group “The Flatters”. Eventually this group joined the basketball tournaments organised by the Filipino Tradesmen Association of Victoria (FILTAV) and renamed themselves “Hopeless’’, a formidable team, coached by Eddie Escall. Milkbar – ano ang milkbar? That is our sari-sari store in the Philippines, hindi lang po gatas ang mabibili dito. Queue – we all got used to this – pila ka – walang tulakan at unahan – you wait until it is your turn. No Standing road sign – not for people but for vehicles, marami po sa atin ang nabiktima nito…..
Let us talk briefly about sports, we have been fortunate enough to have a balanced lifestyle in Australia and enjoy a game or so of the elite sports such as tennis and golf. I called these elite because in our old country we cannot have easy access to these games, particularly golf. Here in Australia, normal lang ‘to — sa golf course may video at picture taking pa! Si Boy, Doming Ortiz, Buddy Espenida at Chito Balazo ang sikat dito, hindi po si Jason Day. I look back now in my retirement years and I know that I made the right decision choosing Australia as my adopted country. We had a choice then to go to America as my wife Lita and I both worked at the US Embassy Manila. But I chose Australia because I knew that this would be the country where I want for my children to grow up. We could maintain our traditional values and family traditions – one of our major contributions to this country, but at the same time be able to merge into a melting pot of cultures. Lita and I are now both retired – from work –but not from life. We worked so hard for years, we have done our duties as parents with both Dennis and Joy at the peak of their careers and have extended our “apostolic” duties to our five gorgeous and smart grandkids – Jake – 19 years old, Zac – 14, Jordan – 14, Mia – 10 and Luke – 9. Now it is time to smell the roses, enjoy life to the fullest and take care of ourselves. By now, puede na po tayong lahat magrelax – alam na natin ang pasikot sikot. There is nothing to prove anymore. Along the way we have all guided our relatives and extended families who are now enjoying life too in this beautiful country. Let us all take good care of our health – marami na po tayong aches and pains – travel if we can, and spend lots of quality time with our families and friends with positive vibes. Life is short- marami na pong nawala sa atin. In conclusion, I believe that we are all beneficiaries of good fortune from this lucky country – we have been given the opportunity to better ourselves and be recognised for our positive contribution to Australia. We can now claim that we were part and parcel of good governance, an integral part of the government’s decision and policy of continued migration from the Philippines. We paved the way – we did the hard yards. We are “The Pioneering Group of Successful Filipino-Australians’’. Enjoy the night mingling with friends especially those you have not seen for a long time. Thank you – Maraming Salamat Po – Magandang Gabi at Mabuhay Tayong Lahat—nang matagal !! (Eddie Joven Atacador was the Chairman of the Philippine Fiesta of Victoria Incorporated (PFVI) from December 1994 to March 1998. He was instrumental in the final acquisition of the Philippine Community Centre (PFVI) Laverton Property in 1995. He was the founding member of the Filipino Tradesmen Association of Victoria (FILTAV) and the Filipino Community Welfare Services (FCWS) . 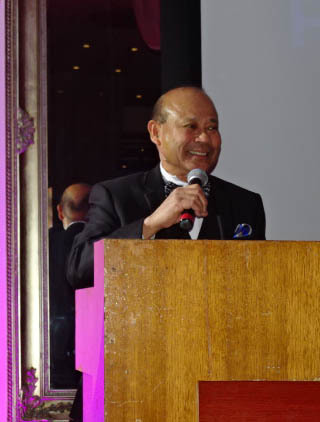 He was the Managing Editor of the Philippine Mabuhay established in 1982, the first Filipino newspaper in Victoria. In 1981, he was elected member of the Management Committee of the Migrant Resource Centre, Melbourne. From 1981 to 1990 Eddie was appointed by the Law Department Victoria and served as Commissioner for taking Declarations and Affidavits in Victoria, Australia.